MUZEMONDAZE IS AN EVOLVING QUARTERLY PLAYLIST COMPILED FROM AN ARRAY OF TIMELY SELECTED UNDERGROUND AND MAINSTREAM MUSICIANS. New York electro-pop singer and songwriter Lolo Zouaï (“zoo-eye”) recently released her debut album, “High Highs to Low Lows”. Named after her 2017 single – of the same name, that went viral – it showcases Lolo’s wide range of both lyrical and musical sound. For example, the sultry half-French "Moi", (Lolo is fluent in both English and French) goes from one speed to another, changing the sound and feel of the track, completely. Lolo immigrated to San Francisco with her family at a young age and this also comes through, in her fashion choices. The latest single from the album, "Ride" leans more towards pop, but with a hi-hat beat and subtly easy vocalizations from Lolo’s soft voice. The track starts with a simple guitar melody and then evolves into this electronic dance-club number. It literally, is a ride, the whole way through. She seems to like this power, singing about it in the second verse as well. The video is also a ride; a bit wild and pretty low profile. It shows Lolo riding, (in many ways, as expected), but also on her motorcycle cuddling a girl, and lying on a different motorcycle altogether by herself. It’s distant, it’s emo, and it’s rad. This rising young artist has impressed us in many ways, and with this debut album, we hope she continues to further succeed. We want to see more of what she has to say, and how she will continue to express it though her visuals and fashion choices. Rapper, Singer, and Empowerment HipHop artist Lizzo, released her very highly anticipated third album, “Cuz I Love You”, and the reviews are in. With her recent career blow-up, she is seeing so much success, and is pushing the boundaries of the music industry along the way. While we have to agree with most, that the whole album is so beautifully arranged, we wanted to focus on “Jerome”; a ballad to a man that Lizzo no longer wants to deal with. With such confidence, she channels Tia and Tamera and asks her lover to go home. Her vocal range is fully showcased here and it adds to the glory of her entire album. While Jerome may not become a single, we appreciate it and want you to enjoy it, too. Also take a listen to the sensual “Lingerie” and the powerful “Like a Girl”, as well! Everyone has a breaking point, and Dinah Jane has hit hers with her man, in her newest single, “Heard It All Before”. The rising post-Fifth Harmony member continues her exploration through R&B with the release of her first EP, aptly titled “Dinah Jane 1”, which includes this single, as well as two other tracks, "Pass Me By" and "Fix It". Heard It All Before has a drum beat that makes the song danceable, but the lyrics and vocals are a bit more reminiscent of an early 2000’s R&B song. She even plays into this aesthetic in the music video; using a flip-phone and dressing like JLo and R&B stars of that time (bucket hat, lots of denim, gold hoops). Her and her girlfriends dance around her room in underwear and pajamas — typical sleepover activities — while she sings to a racially ambiguous underwear model, that she is done. Basically, the lesson at play is about moving on from your man 101. It is cute, playful, and clearly shows off Dinah Jane’s dancing chops. Three years of the same behaviour with no growth? Nobody. Has. The. Time. This three-part EP is surely a brief introduction to what Jane will sound like, for her upcoming debut album. The melodies also slightly remind listeners of a project you would come to hear from the popular hit TV music series, “Star”. Dinah Jane had a running start with her single Bottled Up, but with this EP and an accompany music video, it only pushes her farther ahead into her own lane. Here, Jane’s vocal range fits seamlessly well for a Pop-R&B star and it really sounds like she’s finding her niche in the oversaturated R&B space. After laying low for many years as a psychedelic-indie, the hidden gem and multi-talented Australian artist, Tame Impala has been on steadily back on the rise. Kevin Parker, who writes, produces, and performs all Tame Impala songs, gained worldwide recognition after superstar Rihanna covered his song, "New Person, Same Old Mistakes"on her multi-platinum album Anti (re-dubbed as ‘Same ‘Ol Mistakes) in 2016. With Tame Impala on the incline, comes new music, as experimental and as original has Parker has created in the past. His latest creation, “Borderline”, follows Tame Impala’s classic vibe; transic, soft vocals, and gorgeous layered music. The track starts with a gentile electric guitar and Parker’s vocals — which are also noteledy — a falsetto dream. 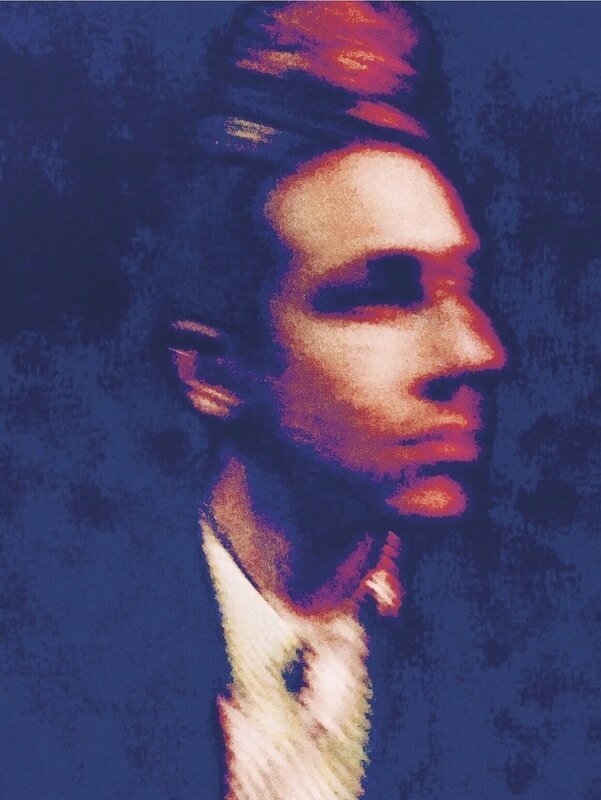 There is a very simple drum beat in the back of the room and that is really it. He knows how to keep it simple, when necessary. When the song starts and you close your eyes, you can almost feel the sun on your skin, and the ice cold lemonade in your hands. 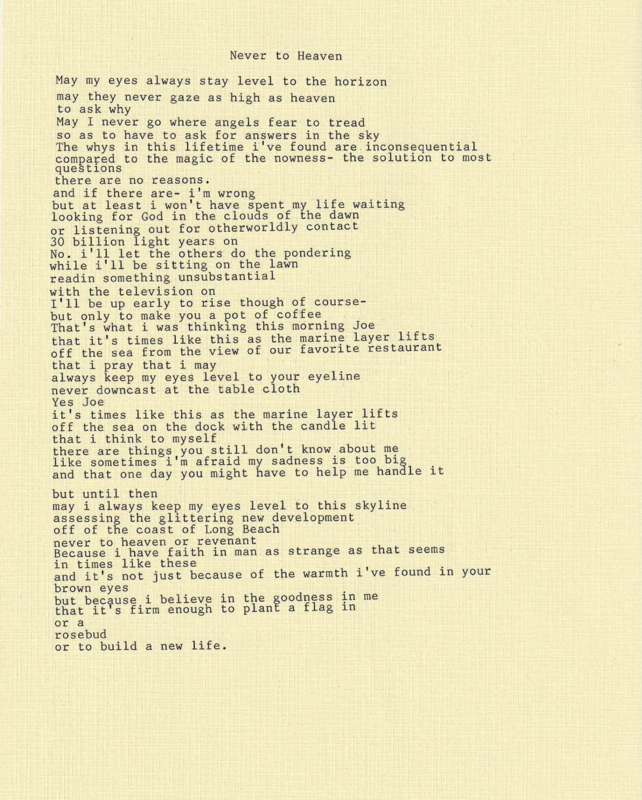 While most of us have likely been in a similar situation, where one decision will drastically affect the relationship or situation, it is hard to determine which outcome Parker prefers here with such lyrics. Modern R&B staple, Anderson.Paak proves he is here to stay, especially by working with Motown R&B legend Smokey Robinson. After Paak’s recent Grammy win, he announced his new album, “Ventura” was to be released this April 12, almost exactly 5 months after the release of his last album, “Oxnard”. With fans overjoyed by news of another album, he released his first two singles from the new work: “King James” and “Make It Better”. “How do you mend when you're worlds apart? The visuals show the ebbs and flows between Paak and his lady friend — from the night they first locked eyes, to the times they are yelling at each other — showing they can learn to love again. They both are well-dressed for the constant cloudy weather of whichever city they live in, and the visual shows that drastic contrast between the good and bad times in the relationship. With the very near release of Ventura, this will surely not be the last single we get from the new cycle. As Paak continues to experiment with her take on R&B, we will continue to be avid listeners. In 2018, the Michigan born artist Bazzi gained noriability with his song Mine, which was hard to miss on the radio as it broke into the top ten on the Billboard hot 100. 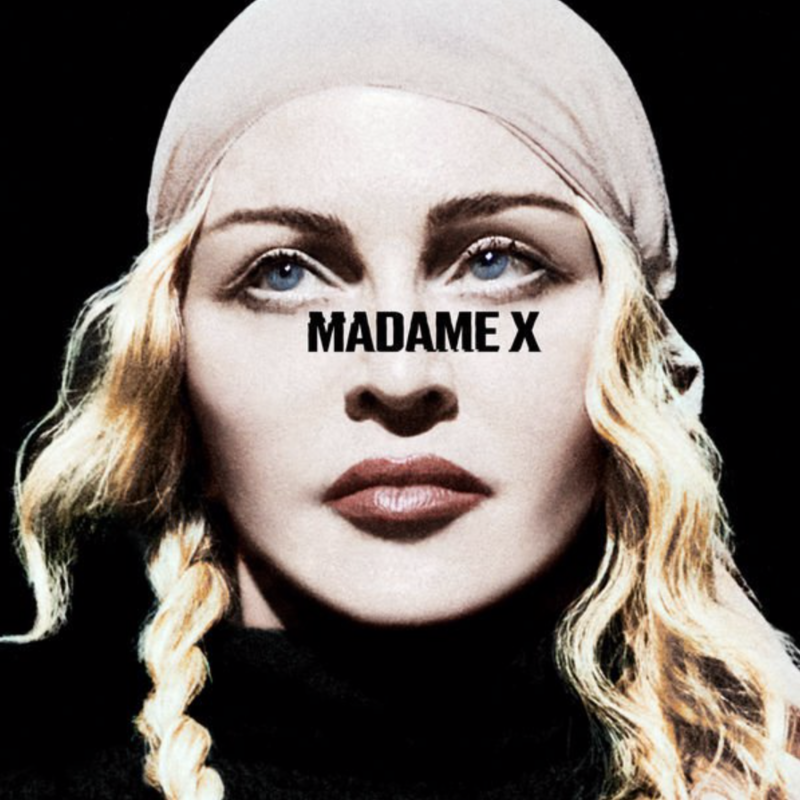 The single itself, was released in 2017 but gained popularity in the following year. Now, just a minor two short years later, he is working to release a follow up album to his debut, “Cosmic”. He has been working on his own music and also writing for K-Pop groups to build his resume, when needed. Bazzi’s new R&B/Electronic track is a love letter, by the name of, “Paradise”. It is not as raunchy or as immature as what could be expected from a 21 year, but it is still playful enough as it experiments vocally. The music video itself, makes some subtly great statements; both in fashion and in celebration. It starts off with Bazzi in a formal black suit and tie, and progresses to other narratives, where he wears a white mock neck sweater, followed by denim on denim attire and a very wet white t-shirt. It features Bazzi and his love interest throughout; a beautiful young lady cuddling under the stars, partying, and even watching a ballerina perform in a glass windowed bedroom. What the video does, is show inclusivity and diversity, as it displays other young couples of multiple genders and races, embracing and kissing. There are also short scenes that zoom in on many different people, who are mouthing the lyrics as well; this aims to present the idea that paradise is subject to interpretation by everyone. Paradise can mean so many things to different people, but most can probably agree, being with the one you love can make everything seem like you’re in heaven. This track is also featured in an upcoming film, such as The Sun is Also a Star, where it will come to new listeners across the world. Fast-rising, pop alternative artist Billie Eilish releases her highly anticipated album titled, “WHEN WE FALL ASLEEP, WHERE DO WE GO?” this week, and critics are raving over it. Since the release of her single, “you should see me in a crown”, hype and rumors have been flying around online about what the dark young artist and her producer brother would have up their sleeves for this second time project. The newest single released is “bad guy”, with a faster beat and rhythm then we are used to hearing from previous Eilish singles. The sound progression is something that so different in terms of a traditional cord layout; as it changes tempo throughout and then finally, leads up to a complete bass breakdown. Starting off with a stripped back melody and light vocals, a drum-clapping beat and keyboard tones phase in through the chorus, keeping an attention to the upbeat narrative. The last 45-ish seconds of the song are completely different; an electric, spooky, and dark verse that carries deep vocals. The music video for bad guy was released at the conclusion of March and several points were made. Eilish appears first through a paper made wall and hands her invisalign — to what looks like — a security guard. Her style is more masculine in general; baggy shirts and heavy pants. She wears thick chokers with metal embellishments, while she sings in front of middle aged round men, and also sits on the back of another man doing push-ups. It’s a masterpiece and at the same time, it’s also a mess. It is respectively, Eilish after all; she is systematically unmatched and can’t be replicated in the slightest. Singer, Ciara announced at the end of March, that her seventh studio album (a first in four years), will be released this May 10th. “Beauty Marks”, the anticipated new album will include the previously released singles, “Level Up”, “Dose”, and “Greatest Love”, and will be released on Ciara’s own label by the same name. In the same announcement, Ciara released a fourth single, "Thinkin Bout You"; a bassy-love letter that is impossible to resist. The musical elements contain a light drum beat, under a very loud and busy, yet, quite consistent bass line; familiar in makeup, to a Prince or Janelle Monae groove. There is a subtle amount of keyboard in the melody too, but the final layer is Ciara’s voice. It is high and airy, which is exactly what the lyrics call for here. The music video — which features Ciara getting dolled up and having a blast while doing it — was published on Friday, March 29, and obtained over two million views by Sunday, March 31. She starts off in a lavish bubble bath, and follows that by dancing across her beautiful bedroom in a yellow graphic crop top and baby doll shorts. She then tries on wigs and floats in the air, in a plush white robe. Ending the video, she struts down the stairs in a front-tie, bralette with arms, and black bell bottom pants (think Selena, here). A very easy and simple video, but it goes well with the song and shows off Ciara's top notch dance skills. While the visual carries a simple attitude, it is still an all around poppy dance track, built for the upbeat car playlist. Sure, Thinkin Bout You is catchy and easy to move along to, but it is nothing like her first three singles; which gives us a glimpse into how diverse Beauty Marks​ will really be for the longtime artist. 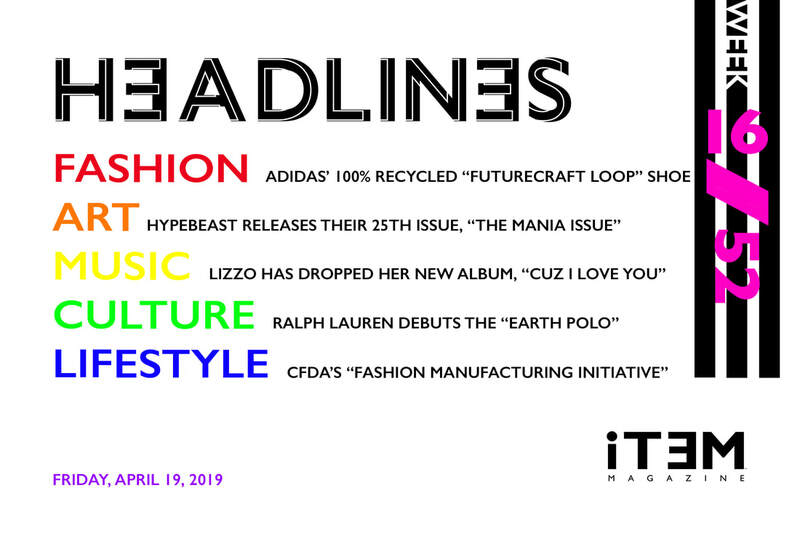 WILLOW SMITH TEAMS UP WITH ADIDAS FOR A SPORTS SHOE CAMPAIGN BEING DUBBED, “FUTURECRAFT LOOP”, WHICH FOCUSES ON MINIMIZING WASTE BY CREATING THE PRODUCT FROM ENTIRELY RECYCLED MATERIALS. THE SHOE DESIGN DOESN’T USE ANY GLUE AND IS MADE FROM 100% THERMOPLASTIC POLYURETHANE, WHERE IT CAN BE RECYCLED AFTER THE LIFE OF THE SHOE. RALPH LAUREN DEBUTS THE “EARTH POLO”, WHICH IS COMPRISED OF 12 RECYCLED PLASTIC BOTTLES AND IS ALSO DYED THROUGH A PROCESS THAT USES NO WATER. THE COLORS COME IN STUART GREEN, WHITE, BABY BLUE AND NAVY, AND THE PRICE POINT IS $89.50. THEY’RE PLEDGING TO REMOVE AT LEAST 170 MILLION BOTTLES FROM LANDFILLS & OCEANS BY THE YEAR 2025. AS PART OF THE “FASHION MANUFACTURING INITIATIVE” BY THE COUNCIL OF FASHION DESIGNERS OF AMERICA (CFDA), 12 FACTORY COMPANIES WHO BARE THE 'MADE IN NEW YORK' CRAFTSMANSHIP, WERE CHOSEN TO RECEIVE A TOTAL OF $730,000 IN FINANCIAL GRANT FUNDING. FIND OUT MORE ABOUT THE RECIPIENTS, HERE. NIKE X STEVEN HARRINGTON'S "MAGIC HOUR" EXHIBITION IN LOS ANGELES, INCLUDES THE LIKES OF APPROXIMATELY 50 PIECES OF ART FROM LARGE SCULPTURES, PAINTINGS, PRINTS, SKETCHES AND COLLABORATIVE SNEAKERS. THE SHOE PORTION FROM NIKE, FEATURES CLASSIC SILHOUETTES OF THE AIR FORCE 1, BLAZER, AND CORTEZ, WHICH ARE PRIMARILY WHITE WITH IMAGINATIVE GRAPHICS. MAGIC HOUR IS OPEN TO THE PUBLIC UNTIL APRIL 22 AND THE ADDRESS IS, 670 S. ANDERSON STREET IN LOS ANGELES, CA 90023. IN A HIGHLY ANTICIPATED ODE TO BLACK CULTURE, THE "HOMECOMING" FILM BY BEYONCE ARRIVED ON NETFLIX; WHICH DOCUMENTS HER ICONIC 2018 COACHELLA PERFORMANCE AND THE DETAILS LEADING UP TO WHAT IS KNOWN AS "BEYCHELLA". ALONGSIDE THE DOCU-CONCERT, BEYONCE HAS ALSO RELEASED AN ALBUM WITH THE LIVE RECORDINGS FROM HOMECOMING. BE SURE TO CHECK OUT ALL THE NEW BEYONCE HOMECOMING MERCH THAT LAUNCHED THIS WEEK, HERE. ACCORDING TO A BILLBOARD ADVERTISEMENT BY THE CULT STREETWEAR BRAND, PALACE IS RUMORED TO BE OPENING UP A LOS ANGELES STOREFRONT THIS APRIL 26. KOREAN STREETWEAR BRANDS YOU SHOULD ALL KNOW ABOUT. ACCORDING TO FASHIONISTA, THEY ARE AS FOLLOWS: ADER ERROR, HYEIN SEO, KYE, NOHANT, 13 MONTH, SJYP, 87MM. READ THE COVERAGE, HERE. PATAGONIA SUES BUDWEISER’S PARENT COMPANY, ANHEUSER-BUSCH INBEV FOR ITS BRAND-IMPERSONATING BEER. IN 2016, PATAGONIA RELEASED "LONG ROOT" BEER, IN WIT AND PALE ALE. ANHEUSER-BUSCH INBEV IS SELLING BEER THAT MAY JUST BE IMPERSONATING THE POPULAR CLOTHING BRAND, EVEN THOUGH IN 2012 IT WAS ALSO GRANTED TRADEMARK REGISTRATION TO SELL “PATAGONIA” BEER. 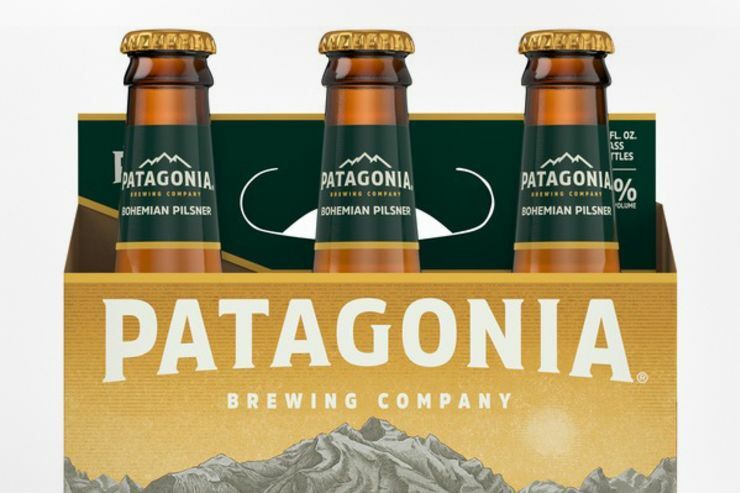 SINCE ITS RELEASE IN 2018, PATAGONIA ACCUSES THE OPPOSITION FOR TRADEMARK INFRINGEMENT, BY SELLING A BEER BEARING ITS NAME AND MARKETING THE ALCOHOLIC BEVERAGE AS THOUGH IT WAS PATAGONIA’S OWN PRODUCT. ACCORDING TO PATAGONIA, THEY SAY ANHEUSER-BUSCH INBEV “HAS GONE AS FAR AS CREATING A LOGO THAT IS STRIKINGLY SIMILAR TO PATAGONIA’S FAMOUS MOUNTAIN SILHOUETTE LOGO THAT HAS APPEARED CONTINUOUSLY FOR DECADES ON MILLIONS OF PRODUCTS.” IN ADDITION TO THIS, THE CLOTHING BRAND CLAIMS THAT THE BEER COMPANY HAS ALSO BEEN SELLING APPAREL AT POP-UP STORES AT SKI RESORTS; MARKETING TO THE SAME CONSUMERS AS PATAGONIA CLOTHING. ANDERSON PAAK RELEASES A 11 TRACK ALBUM, “VENTURA”, AND FEATURES ARTISTS LIKE ANDRÉ 3000, SMOKEY ROBINSON, JAZMINE SULLIVAN, AND BRANDY. WE RECOMMEND CHECK OUT TRACKS: “COME HOME”, “KING JAMES”, AND “JET BLACK”. READ THIS WEEKS MUZEMONDAZE SPRING 2019 PLAYLIST ENTRY #4, “MAKE IT BETTER” BY ANDERSON.PAAK FEAT. SMOKEY ROBINSON, HERE. DISNEY + IS LAUNCHING ON NOVEMBER 12 AND WILL COST SUBSCRIBERS $6.99 PER MONTH OR $69.99 PER YEAR. PACKAGES WILL INCLUDED THE LIKES OF ALL THINGS DISNEY, PIXAR ANIMATIONS, THE MARVEL UNIVERSE, AND THE STAR WARS EMPIRE, TO NAME A FEW. THE NEW PLATFORM WILL ALSO HAVE ORIGINAL SHOWS EXCLUSIVE TO DISNEY, AND WILL START WITH AN ARCHIVE THAT WILL SPANS ACROSS 400 PLUS MOVIES, OVER 7500 TV EPISODES, AND ALSO FEATURE CLASSIC ANIMATED FILMS FROM THE DISNEY VAULT, SUCH AS SNOW WHITE, LION KING AND LITTLE MERMAID. ACCORDING TO THE UNITED STATES PATENT AND TRADEMARK OFFICE, THE TRADEMARK FOR "FENTY SKIN" WAS OFFICIALLY FILED WITH THE FEDERAL AGENCY ON MARCH 25TH, 2019. THE FILING COVERS SKIN CARE, BODY CARE, PERSONAL CARE PRODUCTS, AND ACCESSORIES. COULD RIHANNA BE GETTING READY TO EXPAND HER FENTY LABEL INTO A SKIN-CARE LINE? AT THIS POINT, MOST LIKELY. JEREMY SCOTT BRINGS PIXELATION TO GARMENTS IN THE NEW MOSCHINO X THE SIMS CAPSULE COLLABORATION. SCOTT WILL INTRODUCE IT DURING COACHELLA THIS WEEKEND AT HIS ANNUAL PALM SPRINGS DESERT PARTY. 125 VINTAGE FASHION SKETCHES BY THE LATE KARL LAGERFELD ARE NOW AVAILABLE TO PURCHASE AT THE URBAN CULTURE AUCTION IN FLORIDA ON APRIL 18. SOME OF THE RARE SKETCHES WERE DRAWN WHILE LAGERFELD WAS WORKING AS A COUTURIER AT THE HOUSE OF TIZIANI IN ROME AND WERE DRAWN FOR WOMEN LIKE ELIZABETH TAYLOR, DORIS DUKE AND GINA LOLLOBRIGIDA. ACCORDING TO THE AUCTION HOUSE, LAGERFELD’S TWO DESIGNS FOR TAYLOR ARE EXPECTED TO SELL FOR AROUND $3,000 EACH, WHEREAS THE OTHER PIECES DATED BETWEEN 1963-1969 ARE ESTIMATED TO SELL FOR AABOUT $2,000-$4000. LIZZO RELEASED HER TRACK LIST AND ARTWORK FOR NEW ALBUM, “CUZ I LOVE YOU”, DROPPING APRIL 19. ON APRIL 2, ARIANA GRANDE FILED A TRADEMARK FOR "THANK U, NEXT" PERFUMES AND BEAUTY PRODUCTS, AT THE U.S. PATENT AND TRADEMARK OFFICE. THE TRADEMARK WOULD COVER EVERYTHING FROM BODY LOTIONS, BATH GELS, BODY SCRUBS, BODY MISTS AND FRAGRANCES. 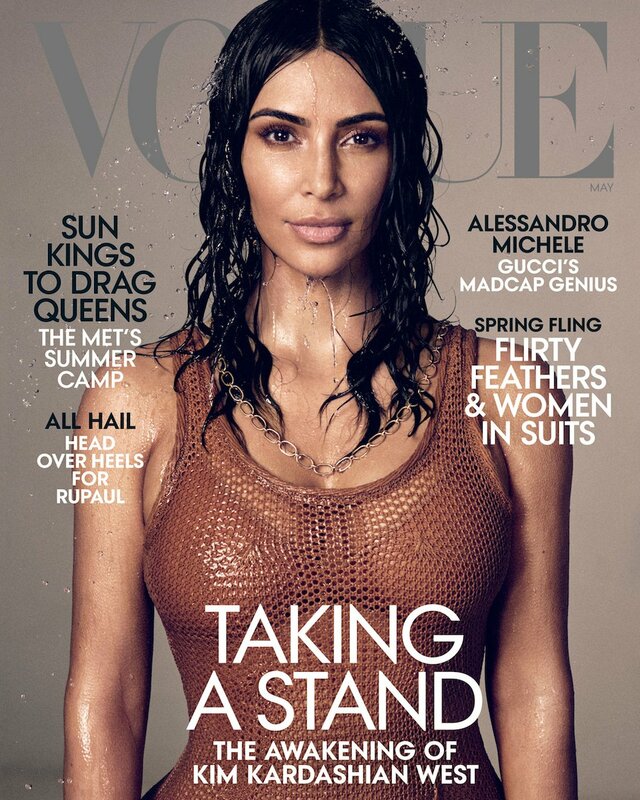 KIM KARDASHIAN WEST LANDS HER FIRST SOLO COVER FOR THE MAY ISSUE OF AMERICAN VOGUE, IN WHICH READERS DISCOVER SHE IS STUDYING TO BECOME A CRIMINAL-JUSTICE LAWYER. READ THE VOGUE COVERAGE, HERE. QUEEN VICTORIA’S APPROXIMATELY £5 MILLION SAPPHIRE AND DIAMOND CORONET THAT WAS DESIGNED BY HER HUSBAND IN 1840, IS SET TO GO ON DISPLAY FOR THE FIRST TIME EVER AT LONDON'S VICTORIA & ALBERT MUSEUM. IT WAS RECENTLY SOLD BY THE ROYAL FAMILY AT AN UNDISCLOSED AMOUNT AND THE BUYER DONATED TO THE MUSEUM’S ARCHIVE, WHERE IT CAN BE SEEN BY THE PUBLIC STARTING ON APRIL 11. A LIST OF ETHICAL STREETWEAR BRANDS ACCORDING TO FASHIONISTA ARE: CHNGE, NOAH, HOMIE, CATCHING A FISH IN NORWAY, HERON PRESTON, BACK BEAT RAGS, AND CHRISTOPHER RAEBURN.READ ABOUT THEM,HERE. SIBERIA HILLS’ DESIGNS ARE OUT OF THIS WORLD, AS “ALIEN CREATURES” SERVES AS THEIR NEW SLOGAN FOR THE SPACE ESTHETIC OF THE SPRING/SUMMER 2019 COLLECTION. FIND THE COLLECTION, HERE. NEIGHBORHOOD X JOHN MAYER ARE BACK TOGETHER AGAIN FOR A GRAPHIC ORIENTED CAPSULE OF MERCH, IN CELEBRATION OF HIS WORLD TOUR STOP IN TOKYO, APRIL 10-11. BILLBOARD AWARD PERFORMERS ON THE NIGHT OF MAY 1, WILL INCLUDE THE LIKES OF ARTISTS SUCH AS KHALID, NORMANI, AND SAM SMITH. TOMMY JEANS X COCA-COLA HAS ARRIVED AND IS NOW AVAILABLE FOR PURCHASE, HERE. THE MEN'S SELECTIONS INCLUDE THE LIKES OF PULL OVER SWEATERS, POLOS AND OTHER LOGO TEE'S, WHILE THE WOMEN'S PICKS HAVE A SIMILAR VARIETY, AND COME IN A FEW CROP STYLES. THE COLOR WAY CELEBRATES COKE'S TRADITIONAL RED AND ALSO USES SHADES OF YELLOW, TEAL, AND NAVY BLUE, THROUGHOUT THE COLLABORATION. FOR A MILAN DESIGN WEEK INSTALLATION AT FUORISALONE, VERSACE HAS COLLABORATED WITH INTERIOR DESIGNER SASHA BIKOFF ON DISPLAY INSTALLATIONS, WHICH WILL SHOWCASE THE NEW "VERSACE HOME" COLLECTION. NETFLIX TEASED A TRAILER FOR A NEW BEYONCÉ FILM, “HOMECOMING”, A SPECIAL THAT WILL COME OUT ON THE PLATFORM ON APRIL 17. IT DOCUMENTS THE SINGERS ICONIC 2018 COACHELLA PERFORMANCE, KNOWN TO FANS AS “BEYCHELLA”. 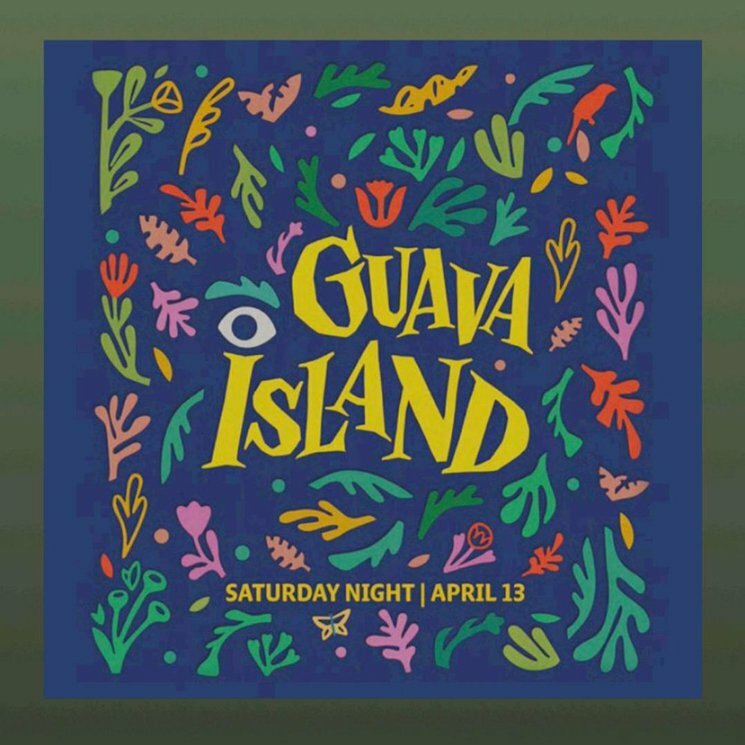 ​ACCORDING TO YOUTUBE, “GUAVA ISLAND”, A SHOT-IN-CUBA MUSIC CENTERED FILM WHICH FEATURES RIHANNA AND DONALD GLOVER, WILL BE RELEASED ON APRIL 13 IN CONJUNCTION WITH THE COACHELLA LIVE STREAM. THE INITIAL SPECULATION STARTED WITH THE MYSTERIOUS ADS PROMOTED BY THE FILM AND MANY PEOPLE ALSO MADE NOTE THAT IT WAS THE SAME TIME FRAME AS WHEN CHILDISH GAMBINO (GLOVER’S STAGE NAME) IS SET TO BE HEADLINING AT COACHELLA. H&M LAUNCHES A BETA VERSION OF AN ONLINE FASHION ADVICE FORUM, THAT ALLOWS USERS TO GIVE AND RECEIVE ADVICE ABOUT STYLE IN AN ASK AND SHARE FORMAT. IT WAS RELEASED BY THE NAME “ITSAPARK” THIS LAST WEDNESDAY AND PLANS TO BECOME A “COMMUNITY DRIVEN DIGITAL FASHION GUIDE." ONCE A QUESTION IS ASKED, EACH ANSWER WILL ACCOMPANY A PHOTO, VIDEO OR STOPPABLE LIST OF PRODUCTS BY H&M AND OTHER RETAILERS. THE SITE ALSO FEATURES A DISCOVERY FUNCTION, WHERE USERS CAN BROWSE A DESIRABLE TREND. YOU CAN ACCESS ITSAPARK, HERE. MARY QUANT RETROSPECTIVE WILL BE AN EXHIBITION AT THE VICTORIA AND ALBERT MUSEUM STARTING SATURDAY, APRIL 6. THE SHOWING PROMINENTLY FEATURES QUANT’S MINISKIRT DESIGNS FROM 1955-1975 AND HAS OVER 200 TOTAL GARMENTS WITH ACCESSORIES, SKETCHES, AND EXCLUSIVE NEVER SEEN BEFORE PHOTOGRAPHS FROM THE DESIGNER. GET TICKETS, HERE. LAST NIGHT, KHALID RELEASED HIS HIGHLY ANTICIPATED SOPHOMORE ALBUM, “FREE SPIRIT”. WE RECOMMEND LISTENING TO THE NEW TRACKS, “DON’T PRETEND”, “HUNDRED”, AND "HEAVEN"
LOUIS VUITTON COLLABORATED WITH LOS ANGELES BASED ARTIST, ALEX ISRAEL, TO DEBUT ITS FIRST UNISEX FRAGRANCES; A SET OF THREE SCENTS INSPIRED BY LA, THAT MEN AND WOMEN CAN WEAR. THE SCENTS ARE PAIRED WITH TRAVELING CASES, COMPLETED WITH WORK DONE BY ARTIST ON THE EXTERIOR. THE FOLLOWING FRAGRANCES WERE CREATED BY RENOWNED FRENCH PERFUMER, JACQUES CAVALIER BELLETRUD: ”AFTERNOON SWIM” HAS BLENDS OF ORANGE, MANDARIN AND BERGAMOT. SIMILARLY, “SUN SONG” USES HINTS OF CITRUS AND REMINDS WEARERS OF THE SUNRISE SURFS ON THE MALIBU BEACHFRONT. “CACTUS GARDEN” RESEMBLES MORE OF A FRESH CUCUMBER AND PRESSED LEMONGRASS BLEND. BRITISH VOGUE’S 2019 BEAUTY AWARD VOTING HAS NOW STARTED; INCLUDING 18 CATEGORIES SUCH AS BEST INFLUENCER BRAND, NEW KID ON THE BLOCK AND CHAMPION FOR SUSTAINABILITY. 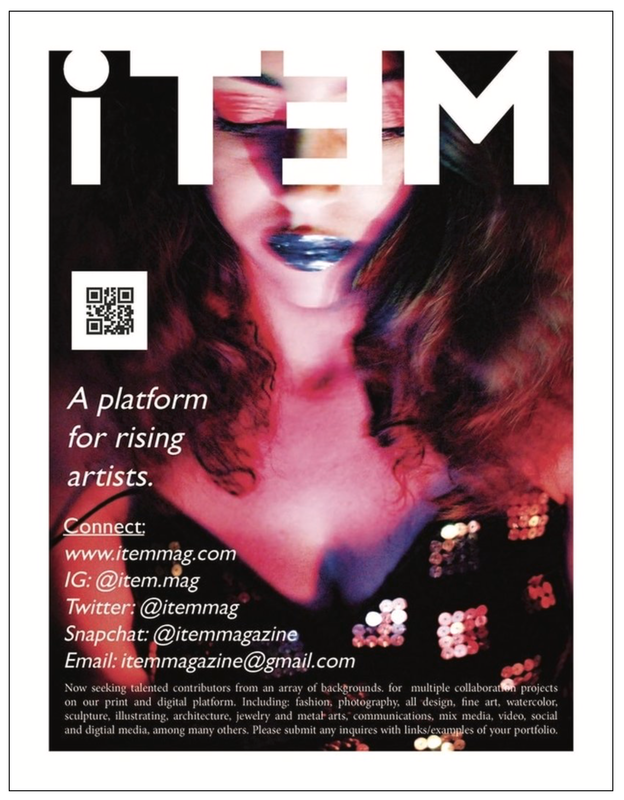 THE VOTING CONCLUDES ON MAY 15 AND YOU CAN CAST YOUR VOTES, HERE.